This article was co-written by Lauren Flum and Natalie Colarossi. The University of Missouri made national news Monday evening after University President Tim Wolfe and Chancellor R. Bowen Loftin announced their resignation in response to student protests regarding racial inaction on campus. The triumph for student activists and protesters was short lived as minority students of the predominantly white campus received backlash. Social media threats toward students as well as on-campus threats have flooded the university. In acknowledgment of this problem, Ohio University students gathered outside of the Scripps Amphitheater at 4:30 p.m. on Wednesday, Nov. 11, to rally and take a photo with the hashtag #OUStandsWithMizzou. The rally was proposed by NAACP Freshman Representative and journalism student Jasmyn Pearl after she discovered the trending hashtag #Mizzou. “It was 11:30 p.m. when I felt the weight of the world on my chest. I felt the fear of uncertainty. I felt my confidence as a strong young woman escape my hands,” Pearl wrote in her blog upon her discovery of the hashtag. “It was 12:35 a.m. when I noticed the bright clusters of stars peaking through the trees. It was time to act,” Pearl wrote. She reached out to the rest of the NAACP executive board, proposing the idea of an event on OU’s campus, and “they were immediately down for it,” said Pearl. NAACP President and OU junior Alexis Apparicio discussed the importance of educating OU students about what’s happening in Missouri. NAACP Executive Board leads discussion on the events at Mizzou as well as racism on college campus. Photo by Natalie Colarossi. 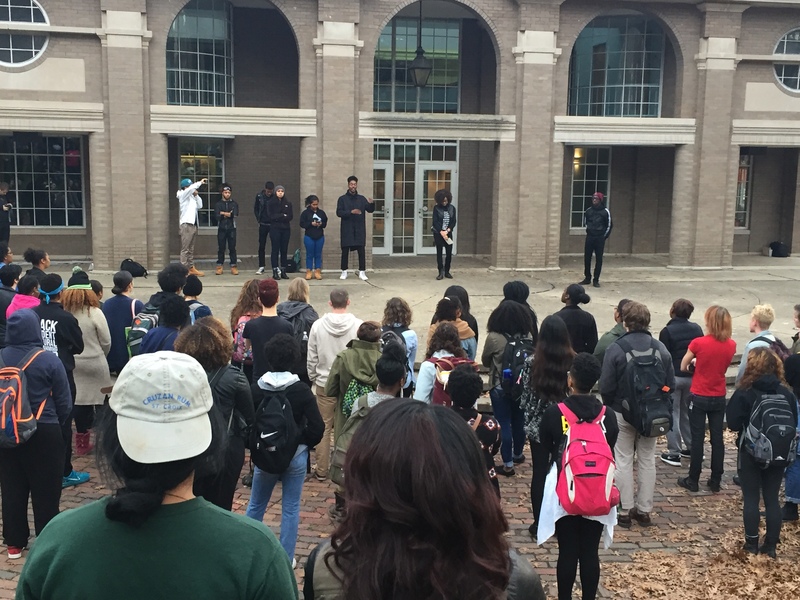 During the rally, students had the opportunity to speak out about campus racism and address the issues and changes they wish to accomplish. Sophomore and Black Student Union member Kymaia Gadsden spoke at the event. Junior political science student Ellenore Holbrook stated the importance of garnering administrative response. “What’s happening on Mizzou’s campus is not an isolated incident,” Holbrook said. To help solve these issues, many students spoke about cultural education, activism and the importance of having an open discussion. With civil rights rallies circulating around college campuses nationwide, Pearl expressed what sort of impact she hopes this photo and accompanying rally created. “Hopefully we can show each other and Mizzou students that ‘hey we see you, we care about you, and we support you,” Pearl said.